Did three Florida hurricanes hit only Republican counties? 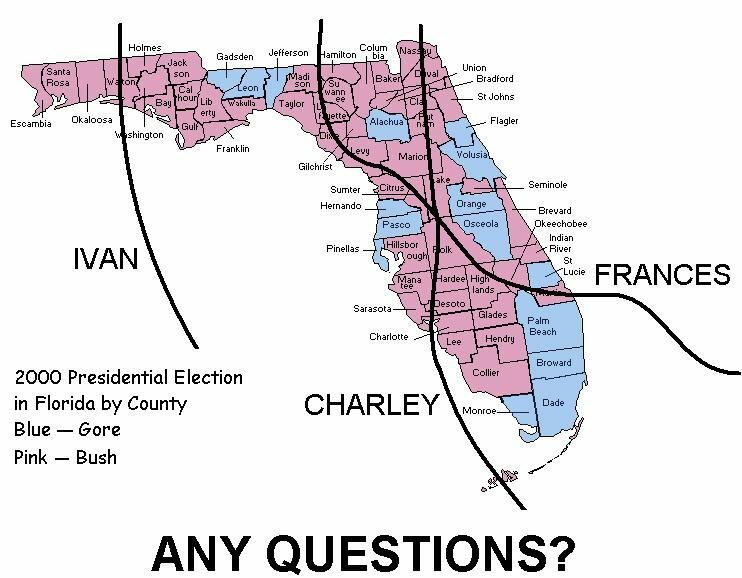 Claim: Three hurricanes that hit Florida in the summer of 2004 touched only counties that voted for George Bush in the 2000 presidential election. would be pummeled by hurricanes just before the next election. Then I thought it was an interesting coincidence that the storms spared Miami, who voted for Gore in 2000. Just out of curiosity, I overlaid two maps: one of the tracks of the hurricanes of 2004, and one of the elections results of 2000. This is no longer an interesting coincidence. It is an unmistakable message from God. I hope everyone is listening. Note: After leaving Florida, Charley hit Georgia and Frances hit Georgia and South Carolina. Both voted for Bush in 2000. The path of Ivan is projected as of Sept. 14. Alabama, Mississippi and Louisiana all voted for Bush. If you have ANY doubt who this message is coming from, watch and see if Ivan veers west to hit those states as well. 1) you do not change anything, 2) this notice remains intact and 3) you do not charge anything. Origins: The map displayed above is a clever bit of political humor, but if God is trying to send United States citizens a message about their presidential choices, He isn’t doing it by unleashing hurricanes on Florida. Hurricane Charley struck Florida in mid-August 2004. Hurricane Frances hit the Florida peninsula in early September 2004. Hurricane Ivan struck the Florida panhandle in mid-September 2004. The map shown above presents the hurricanes as if they traversed neat, narrow paths, hitting only counties that voted for George Bush in 2000 (colored pink) and avoiding all counties that voted for Al Gore (colored blue). It took some finagling with the actual storm data to produce those results, however. Charley continued its track northeast across DeSoto, Hardee, Polk, and Osceola counties. At approximately 9:15 PM EDT, the eye of the storm was centered at Kissimmee, over northern Osceola County. Charley then moved over the Orlando area between 8:45 PM and 9:30 PM EDT. Orlando International Airport reported a gust to near 105 mph at 9:15 PM EDT, with sustained winds anywhere from 60-70 mph. By 10:09 PM EDT, the Sanford Airport just northeast of Orlando was gusting to 92 mph. The circulation center of Hurricane Charley passed over the coast near Daytona Beach at approximately 11:30 PM EDT. At 11:25 PM EDT, the Daytona Beach Airport observed 69 mph sustained winds, with an 83 mph gust. Charley emerged off the Volusia County coast and back into the Atlantic just northeast of Daytona around 1:00 AM EDT on Saturday, 14 August. By 2:00 AM EDT, the center was over the Atlantic about 45 miles north-northeast of Daytona Beach, with maximum sustained winds of 85 mph and a minimum central pressure of 993 millibars. About $740 million in damage from Hurricane Frances has been reported to privately owned buildings in unincorporated St. Lucie County, most of it to residences, including mobile homes, according to a report released Monday. About $123 million of the damage was to mobile homes and $504 million was to other residential properties. The rest, $113 million, was to commercial property. Damage to county, municipal and school district property was put at more than $120.6 million. County department heads prepared the report for county commissioners. After lashing Pasco County for most of the day Sunday, Tropical Storm Frances damaged mobile homes, toppled trees and left roughly 52,000 people without power. The winds grew so severe around noon that officials pulled fire and rescue crews from the roads, fearing the high gusts could tip over the large ambulances or firetrucks. Until Sunday evening, crews responded only to life-threatening emergencies after evaluating conditions on a case-by-case basis. George Bush won all the states on the Atlantic coast north of Florida up to the Virginias, all the states west of Florida clear over to Texas, as well as every other state in the South. Unless a hurricane miraculously skipped several hundred miles overland all the way from Florida to New Mexico or Illinois, without touching any intervening states, any other state it hit was bound to be one that voted Republican in 2000. St. Petersburg Times. 6 September 2004. USA Today. 27 September 2004 (p. A4). Palm Beach Post. 21 September 2004.